Wind Energy has emerged as one of the cleanest, safest and cost effective forms of energy. However as with any new technology, a small percentage of the population may be wary of the development of wind farms. A vocal minority often make arguments against wind power which are usually little more than myths. With growing concerns around climate change, energy security and increasing fossil fuel prices, there is a need for Ireland to develop sustainable and indigenous energy resources. Ireland has been given a mandatory target by the EU for 16% of its energy to come from renewable energy sources by 2020. IWEA believes that, in the drive to meet our national targets, decisions on potential wind farms should be made on the basis of facts and informed debate, not through myths and half truths. The document below is an attempt to evaluate and address some of these concerns with solid research facts. Fact: The cost of generating electricity from wind has fallen considerably over the past decade. This has left the Wind Industry as a leading competitor on price with fossil sources of generation. As fossil fuel prices increase and wind power costs fall, wind becomes even more attractive. In 2011, the Irish Wind Energy Association commissioned Redpoint Energy to undertake a study on The ‘Impact of Wind on Pricing within the Single Electricity Market’ which found that an 11.5% reduction in wholesale electricity prices will be achieved through delivering 45% of the overall generation mix from wind by 2020. In simple terms this would mean a saving of €39 per household. Fossil fuels are not going to last forever and it is becoming harder to predict what the cost of these fuels will be in 5, 10 or 15 years time. Renewable energy provides a hedge against these uncertainties and with wind, the cost is always known. Fact: There is a feed in tarrif support scheme in Ireland known as REFIT, that operates by guaranteeing new onshore wind energy generation a minimum price for electricity exported onto the grid for a period of 15 years, in the situation where the wholesale market price falls below a certain point. In Ireland the PSO (Public Service Obligation) levy is utilised for this purpose. The PSO is a charge on all electricity customers’ bills to support certain peat, gas and renewable generation as mandated by Government and approved by the European Commission. The basic policy behind the levy is one of promoting energy security of supply for the country through the use of indigenous fuels and promoting renewable energies. The level of support covered by the PSO depends on the average electricity price in the year. When electricity prices are high there is little or no payment from the PSO to wind generation. There are also times when generating wind plant contributed a surplus to the PSO. When the reduction in wholesale electricity prices is also taken into consideration wind energy will actually deliver savings to the consumer. Fact: The continued development of wind farm technology over the past decade has rendered mechanical noise from turbines almost unnoticeable. The table below shows a noise level comparison taken from a report by the National Health and Medical Research Council of Australia in 2010 . Wind technologies are significantly improving each year with new manufacturing techniques resulting in lower sound output. For doubters, we always recommend that you visit a wind farm to see for yourself. Fact: Concerns regarding the adverse health impacts of wind farms tend to focus on both noise and electromagnetic interference. The World Health Organisation states that 'Wind energy will in fact have positive health benefits'. Credible peer-reviewed science and various government reports in the U.S., Canada, Australia and the U.K. refute the claim that wind farms cause negative health impacts. Most recently, in January 2012 wind energy got a clean bill of health from a panel of independent experts established by the Massachusetts Departments of Environmental Protection and of Public Health . The agencies definitively stated that “There is no evidence for a set of health effects, from exposure to wind turbines that could be characterized as a ‘Wind Turbine Syndrome’”. The detailed analysis also noted that “the strongest epidemiological study suggests that there is not an association between noise from wind turbines and measures of psychological distress or mental health problems.” More specifically, “available evidence shows that the infrasound levels near wind turbines cannot impact the vestibular [inner ear] system.” The important thing to remember is this: because wind power displaces emissions of air pollutants and toxic materials like mercury, its effect on public health is strongly positive. Fact: Some anti-wind proponents exaggerate the threat to birds. The American Bird Conservancy notes that wind turbines kill just 0.088% of the 500 million birds killed each year by pet cats in the US. Today, the wind energy industry in Ireland has put procedures in place to enhance our understanding of birds and how they interrelate with wind turbines. The modern wind farm undergoes a series of environmental assessments before being approved. In this process, the proposed site will be monitored and bird populations evaluated. There are many questions answered in an effort to better understand the on-site bird populations and to protect some of our most endangered species. Once built, further monitoring takes place to better understand the ongoing relationship between birds and the wind farm. 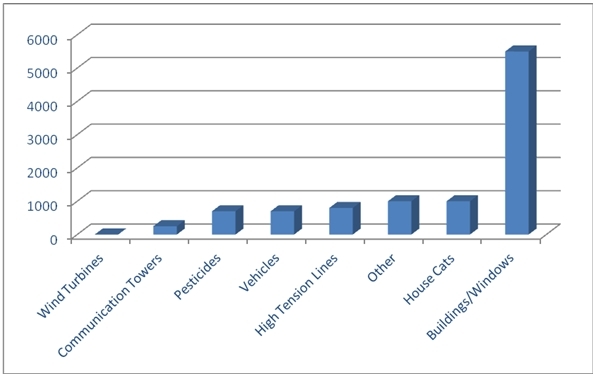 The chart below provides evidence on the small impact wind farms have compared to other manmade structures . The biggest danger to birds at present is global warming. A status report compiled for WWF finds a clear and escalating pattern of climate change impacts on bird species around the world, suggesting a trend towards bird extinction from global warming. Scientists have found declines of up to 90 per cent in some bird populations, as well as total and unprecedented reproductive failure in others as a result of climate change. Wind energy plays an important role in the mitigation of climate change. For every 10,000 bird deaths, less than one is caused by a wind turbine. Fact: Efficient turbines that are installed today are as a result of decades of R&D. A modern wind turbine can produce electricity 90-95% of the time, and its output depends on wind speed. Over the course of a year, it will generate about 30% of the theoretical maximum output. This is known as its load factor. The load factor of conventional power stations is on average 50%. The average installed turbine can supply power to approximately 1000 homes. Fact: Beauty is in the eye of the beholder and like everything in life, people will tend to have different opinions on what looks nice and what looks ugly. Wind farm developers have computer-modeling tools that create simulations of views from given spots in the surrounding area. When a wind project is carefully designed it is able to alleviate visual concerns. There are numerous studies showing most people fnd turbines an interesting feature of the landscape. In 2008 Bord Fáilte commissioned a survey of visitor attitudes to wind energy which found that the vast majority of visitors saw wind energy as a positive development for Ireland. The majority of tourists surveyed did not feel a wind farm was a negative addition to the landscape. Similarly, a survey commissioned by Renewable UK in March 2012 found that 66% of the UK public are in favour of wind turbines. Fact: There is currently no evidence to show that wind farms are having a negative impact on the Irish property market. A US government-funded study ‘The Impact of Wind Power Projects on Residential Property Values in the United States’ carried out in 2009, recorded the sale price of around 7500 homes in nine states and then devised mathematical models to reveal how, all other things being equal, proximity to a wind farm affected their value. It found that homes less than 1.5 kilometres from a wind farm sold for no less, on average, than homes 8 kilometres away. Similarly, home values tended to remain stable long after wind farms sprung up. Fact: Wind Energy has grown at an incredible rate in the past two decades and has been extremely successful in Germany, Spain and Denmark to name but a few. Despite economic turmoil in the last few years, Wind Energy has been successful and has continued to see increasing levels of development and investment. The ‘Green Growth’ report produced by EWEA, in 2012 outlines that the European wind industry grew more than twice that of the EU’s overall GDP between 2007 and 2010 despite the challenging economic climate. Similarly the USA, India and China are all expanding their wind energy programmes. A report produced by the Worldwatch Institute confirmed that China led the way with a 43% share of global capacity additions in 2011, followed by the United States at 17%, India with almost 7%, and Germany at 5%. Fact: All forms of power generation require back up and no energy technology can be relied upon 100%. Variations in the output from wind farms are barely noticeable over and above the normal fluctuation in supply and demand seen when the nation's workforce goes home, or if lightning brings down a high-voltage transmission line. Therefore, at present there is no need for additional back-up because of wind energy. Power systems and new conventional power plants are and will be designed to work in harmony with the growing number of turbine installations to reflect the changing fuel mix for future power generation. Wind energy is now “integrated” into the existing system to act as a fuel-saver enabling Ireland to harness a free electricity source when available. Fact: The average wind farm will pay back the energy used in its manufacture within 3-5 months of operation. A modern wind turbine is designed to operate for more than 20 years and at the end of its working life, the area can be restored at low financial and environmental costs. Wind energy is a form of development which is essentially reversible – in contrast to fossil fuel or nuclear power stations. Source: Erickson et al, 2002, Summary of Anthropogenic Causes of Bird Mortality.